cilitating acts and goals that centralise and prioritise, to serve the saturation of the roles. The latest four channel video installation Commerce Des Esprits consists of a script-based mono- logue through animation and text. With exits of the subject's consciousness, the power of meton- ymies is guided towards being satiated, while within the four channels, "translations" and "com- parisons" are treated as replaceable linguistic spaces. Between the three languages French, Eng- lish and Chinese, the text of Zhuangzi establishes various forms of expression. The monologue of the artist’s mother relies on sounds to lead the needs of each language towards the protagonists. The polyphonic lover in the single channel video Warm Spell awakens thousand desires in the black and white protagonist with her changing moods, calling up instincts and memories. On Thailand’s Koh Yao Yai, two independent subjects, as lovers and partners, balance the potential needs of others and judgments on alterity. Climate and habitation, race and experience, fill and deconstruct protagonists’ senses. imaginations that are identifiable. Hence the localised risk and comfort of the sites, become the medium of the materialised and haunting presence of the protagonists. to be known to others that is reflexive of images’ representational agencies. Shen Xin (1990, Chengdu) lives and works in London and Amsterdam. 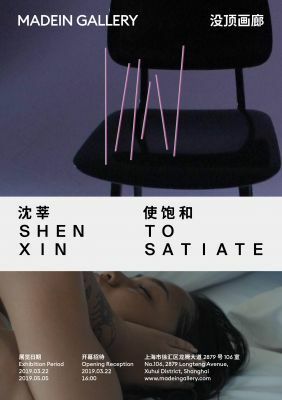 Through films and video installations, as well as performative events, Shen’s practice examines and fabricates techniques and effects of how emotion, judgment, and ethic circulate through individual and collective sub- jects. By focusing on interpersonal complexity and political narratives, her films often aim to gen- erate reflexiveness to dismantle dominant power structures. Her recent solo presentations include Methods of Inhabiting, K11 Shanghai (2018), Sliced Units, Center for Chinese Contemporary Art, Manchester (2018), half-sung, half spoken, Serpentine Pa- vilion, London (2017), and At Home, Surplus Space, Wuhan, China (2016). Recent group shows include New Metallurgists, Julia Stoschek Collection, Düsseldorf (2018), Songs for Sabotage, the New Museum Triennial, New York (2018), and The New Normal, UCCA, Beijing (2017). Shen was awarded the BALTIC Artists’ Award in 2017, and she is currently an artist in residence at the Rijksakademie, Amsterdam.